The Rehab charity group has said it will meet with polio survivors who have said they feel the charity has abandoned them. 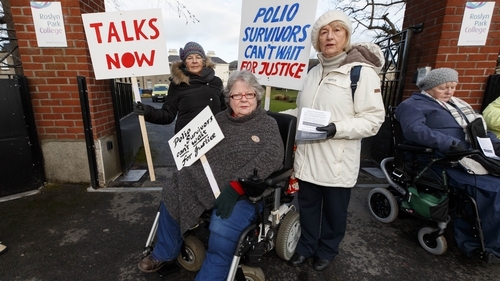 The Justice for Polio Survivors group staged a protest outside the Rehab Group headquarters in Sandymount, Dublin, saying the charity has not properly funded services for their members. However Rehab has rejected the notion that they have abandoned survivors. They said polio groups received grants out of the charitable lotteries fund up until it closed in 2015. Rehab also say they will meet with survivors to discuss their issues before the end of next month. Survivors say their needs are pressing because the disease is particularly debilitating with age. It is estimated there are 7,000 polio survivors living with the disease in Ireland. The last recorded case of an Irish person contracting the disease here was over 30 years ago in 1984.